On a cold fall or winter's day there's nothing quite like a nice hot bowl of soup to warm and fill you up. I remember as a child I'd be outside ice skating at our local rink, and knew that when I returned home for lunch or dinner my grandmother would always have a pot of soup waiting on the stove. Soup to me is pure comfort and satisfaction. I am not a vegetarian but at least once a week I like to have a meatless meal. 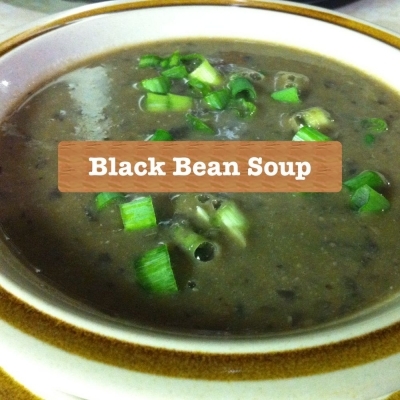 Black Bean Soup is one of my favorites to serve. It is not only delicious but very healthy as well. Please note that I've used chicken broth in this soup. To make it an authentic vegetarian soup simply change the chicken broth to vegetable broth. This cream soup can be served alone for lunch, dinner or as side dish. Quite often I will serve it with homemade quesadillas. You can use various topping such as: chopped green onions, a dollop of sour cream, grated cheese, or tortilla chips. The following recipe will serve 5-6 people, and can be on your table from start to finish in approximately one hour. Prepare the onions, celery, carrot and garlic cloves. In a large soup pot or dutch oven heat the the canola oil. To the pot add the prepared vegetables along with all of the spices. Cook and stir until the vegetables are soft. To the pot add and stir in the chicken broth and water. Next add the black beans and bring everything to a boil. Turn the heat down to a simmer, cover and let the soup cook for 30-45 minutes or until the beans are tender. In batches you are now going to puree the soup. I used my blender for this. Add the soup back into the pot, heat, and then serve when ready. Top with green onions, sour cream, grated cheese, or tortilla chips.